A pair of anything but boring hand vacuum concepts for Boring Things. Do you follow Boring Things over on Instagram" If not, we recommend their feed to those with an affinity for industrial design ? an account documenting designers taking on the task of attempting to transform mundane objects like binoculars, coffee grinders, and hand vacs into evocative forms. 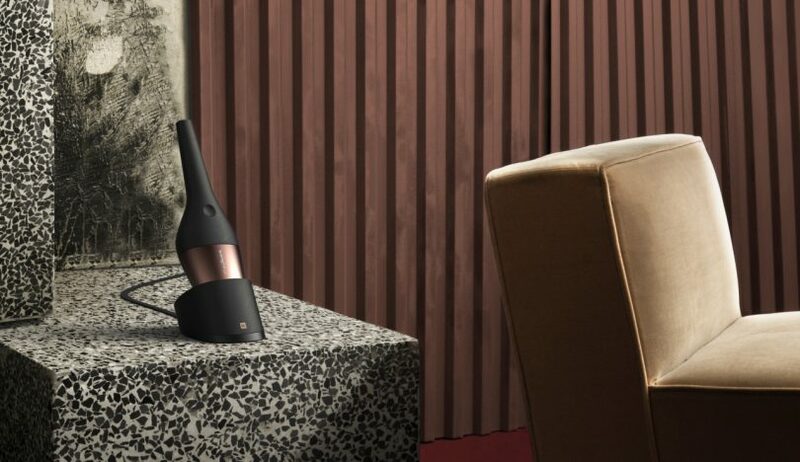 Their latest stab at invigorating a common object is Tassilo Eissing’s KLEEN hand vacuum, a luxurious and sleek interpretation of the dust busting tool. Seen from the side, KLEEN’s sleek and sophisticated takes on the appearance of a Japanese santoku kitchen knife, with the handsome combination of black handle with bronzed suction head housing glamming up the task of cleaning without altering the form factor all too much from what we equate with a hand vac. Primarily an aesthetic skin job, the KLEEN seems to otherwise host the same suction technology as existing hand vacuums. Boring Things’ previous hand vacuum concept, the Drip by Christoph Andrejcic Graz of Austria diverges even further from the identifiable form of the handheld vac, a cleaning appliance that has not diverged all too much since the Dustbuster’s introduction in 1979 (minus Karim Rashid’s playful and unwieldy, Kone for Dirt Devil back in 2006). Nevertheless, here’s to hoping to vacuums worthy of keeping out between cleaning sessions like these two concepts.